University of Hong Kong Associate Professor Dr. Yeewan Koon presents Deconstructing Ink: New Ways of Thinking about and Looking at Ink Painting Today- a lecture which questions the very history and modern interpretation of traditional ink painting. 「By examining some of the basic principles of ink painting, the history of the tools and the ways in which painting was viewed, this talk provides a broad introduction to a history of how painting was understood, the role of the artist, and proposes new ways of thinking about how we look at ink painting today,」 suggests Koon. Dr. Yeewan Koon is an Associate Professor in the Department of Fine Arts at the University of Hong Kong. Her primary research area is Ming and Qing paintings, with a secondary focus on modern and contemporary art in China and Hong Kong. Her book, 「A Defiant Brush: Su Renshan and the Politics of Painting in Guangdong」 connects Su, an artist who challenged the social and political structures that have long defined the role of an artist during the time of the Opium War, with the art worlds of the Pearl River Delta region. She is the recipient of several research grants, including a GRF grant from Hong Kong Research Grants Council for her next book project, which explores the practice of copying in Chinese art from the 16th to 20th centuries. 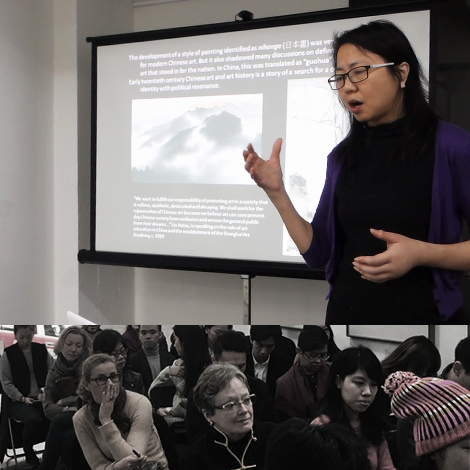 This lecture coincides with Karin Weber Gallery exhibition: Seeking Inner Peace: Works in Ink by Xu Jingwen and Angel Hui, a show that introduces the work of two young Chinese artists returning to ancient practices and subject matter which capture an age old spirituality many find absent from today’s world. Traditional Chinese culture values the human spirit and a virtuous life lived true to one’s heart, reflecting ancient philosophies such as Confucianism and Daoism. Artistic expressions of these beliefs often find their voice through the equally ancient, calligraphy-based medium of ink painting. Xu Jingwen (b. 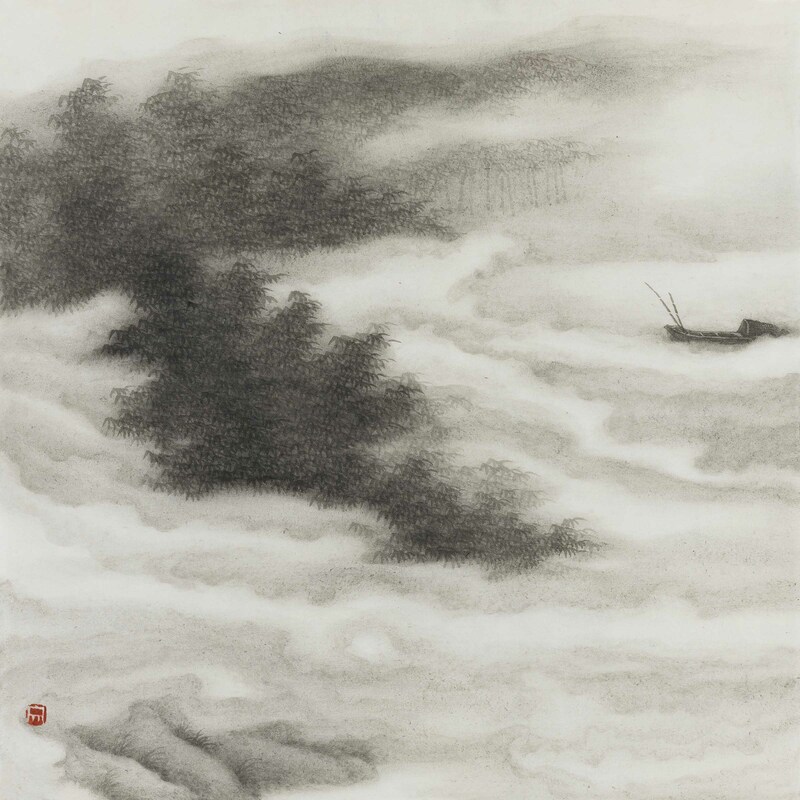 1982), depicts the spiritual side of humankind in his Plain Landscape series, closely following in the footsteps of the most treasured masters of Chinese landscape painting. For Xu nature, paradoxically, becomes a metaphor for the spirit of the artist and all mankind. His small, focused landscapes — depicting trees, rocks, clouds and sky – are purposely devoid of human presence. Xu’s intention, by eschewing a large-scale format, is to immerse the viewer in the peaceful settings he creates. Angel Hui (b. 1990), dedicates her practice to the examination of traditional Chinese motifs, symbols and patterns found in objects and decorations. By coupling age-old concepts with the unique influences of the present, such as ready-made and often disposable objects, Hui suggests an innovative way of celebrating meaningful cultural traditions.